Sun and clouds mixed. Slight chance of a rain shower. High 61F. Winds W at 15 to 25 mph..
Katy Dalton, owner of Blossoms and Blooms in Fairfield, poses with one of her creations. Katy Dalton makes one of her first deliveries last week to Carrie Otness. Without missing a beat, Fairfield and area residents will continue to be served by a local florist. With the recent sale of the building that had housed In The Garden Floral, new owner of the building, Andy Watson, sold the floral business to Fairfield’s Katy Dalton. Katy’s business will be Blossoms & Blooms. For now, Katy will operate from her home. Katy grew up in Fairfield. Her grandma, Loyann Kimmery, owned and operated the flower shop when Katy’s dad, Tim Kolste, was growing up. Katy graduated from Fairfield High School in 1998. 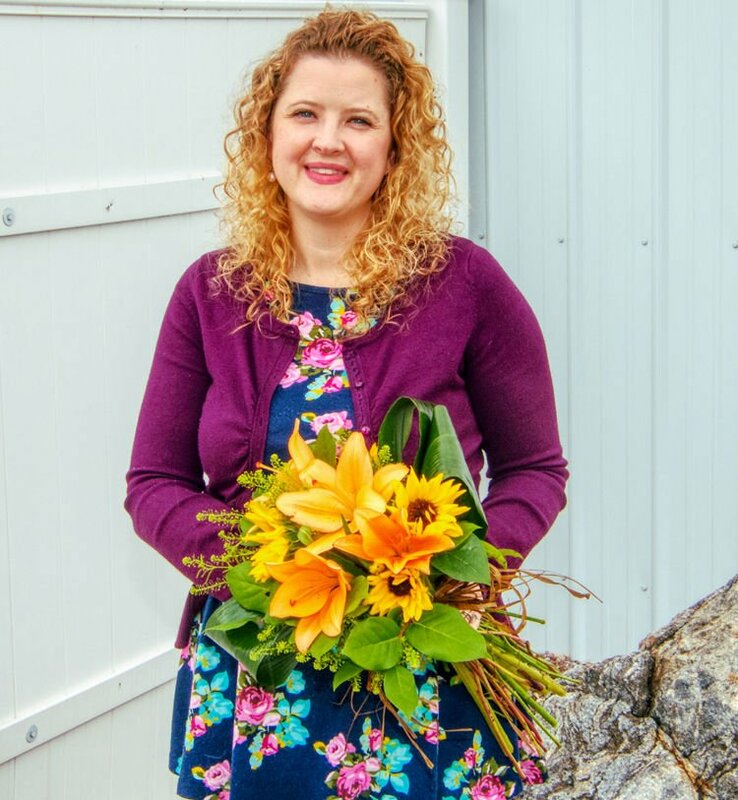 She has an associate degree in Interior Design from MSU-COT and she received her certificate in floral design from The Floral Design Institute in Portland, Oregon. Over the years Katy has worked at several different floral shops in the area: Electric City Conservatory, Kranz Flower and Gifts, and Great Falls Floral. She also worked at Bitterroot Floral in Missoula. When Joan Myrhe, at In The Garden Floral, needed extra help during the holidays or while she was on vacation Katy was there to step in. Katy plans to serve the same broad area as Joan did, making deliveries within Fairfield, as well as Augusta, Choteau, Power and the Sun River Valley. Asked what flowers were most popular, based on her experience, Katy told the Sun Times that roses and lilies are always popular. Some flowers are tied to the seasons, with tulips and daffodils being popular in the spring while sunflowers are a big seller during the summer months. For those who are clueless as to what flowers are appropriate for an occasion, Katy says there are easy solutions. “Anyone can go to a florist’s website and find an arrangement they like and just send me the website address, or just tell me what they like – the type of flowers and the colors.” Katy said that she can take her cues for a great floral design just by being told what colors a person enjoys most. Blossoms & Blooms will be a full-service florist, serving the needs of the area with flowers and plants for weddings and holidays – “get your Easter orders in soon,” Katy suggests. Katy will also take care of the floral needs for funerals. Since she will be working out of her home for now, Katy will not be accepting walk ins, but she will be available for pick up and making deliveries. Blossoms & Blooms hours will be Monday through Friday, 10 a.m. to 4 p.m. You can email orders to blossomsandblooms@yahoo.com or give Katy a call at 467-2345.